Is sea sickness spoiling your client's enjoyment of life? If they love yachting, cruising or boat trips then sea sickness can deprive them of a pleasant voyage. 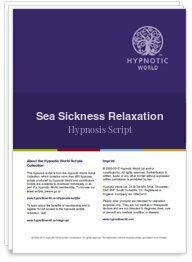 This hypnosis download has successfully helped many people to overcome sea sickness. It will guide your client into a gentle state of relaxation during which time the deepest part of their subconscious mind will be receptive to the positive suggestions contained.